One of the best things about the wedding industry is that it’s always changing! With all the weddings we do at Sand Springs, not a single wedding is the same. Every couple and wedding vision is so different. While some things remain consistent through the years, ideas and products are always changing. This doesn’t always apply to weddings, but to events too! Although the industry is ever-changing, the final product is not. No matter what new idea a couple brings to us, our goal is to always deliver the vision they imagined from the very beginning – THAT is the final product. For this blog we will be talking about a handful of trends to look out for this 2018 season! While most trends we’ve seen in the past feature aisle bows, lanterns and flower petals, potted plants are going to be the new thing for ceremonies! And no, this isn’t just your typical potted plant you see displayed in the front of the grocery store. We’re talking big lush greenery that coincides with the natural landscape of having an outdoor ceremony. Many couples are also incorporating their color scheme by wrapping the pots with beautiful color chiffon wrapping. It’s the perfect balance of nature and tying everything together. This really started to make an entrance into the wedding industry last year, but this year is going to be the year of hanging floral. The idea of feeling fully surrounded by beautiful, fresh flowers has many couples incorporating this into their ceremony area (& reception too!). While we don’t allow anything to be hung from our ceiling in the Celebrations Ballroom, we have our beautiful pergolas and outdoor pavilion that would be the perfect spot to try out this trend! Texture, Texture & More Texture! So many couples want their wedding to stand out! Textured linens are the way to go. For as simple and detailed as this trend is, it definitely doesn’t go unnoticed when your guests enter your reception. From a pin-tuck style to a rosette style (& maybe some sequin glitter in there too!) 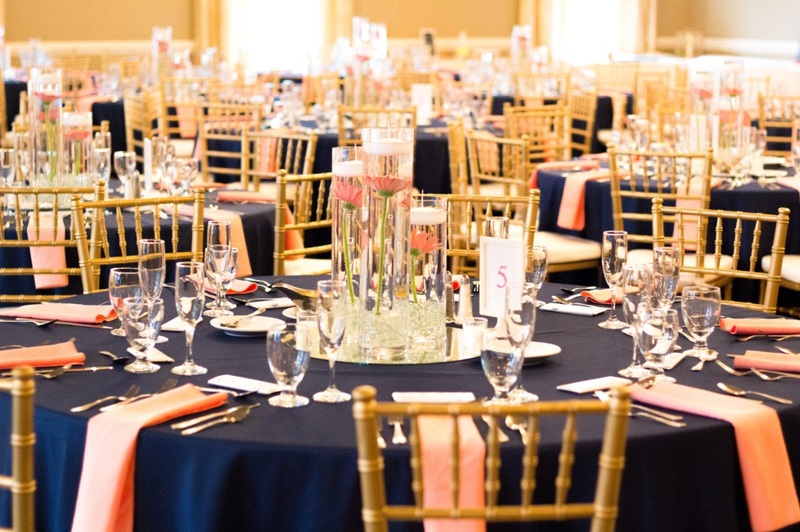 linens can make an enormous difference in the overall style of your wedding. While a regular polyester is still beautiful, maybe mix it up and do a fun napkin fold or add elegant charger plates to your reception tables. We saw a good handful of these wreaths in 2017 and it was by far one of our favorite wedding pieces. With our beautiful stone fireplace in the ballroom a customized wreath is the perfect piece to hang above the fireplace. They are also a great piece to hang out in the front entrance of the Celebrations Ballroom. Wedding wreaths don’t necessarily need to have real fresh flowers on them, but you can easily create this piece yourself at home with beautiful silk florals, ribbon and more. It’s a great item to re-use even after the wedding is over too. Dessert tables have always been a staple for weddings but the creativity of them have gone up about 20 notches the last couple of years. From vintage cupcake stands to wooden displays this is no longer your typical dessert table. Many couples are even displaying their wedding cake on the same table as the rest of their desserts! At Sand Springs we have an assortment of beautiful trays, tiers and cupcake stands so leave it up to us to make your display come to life!